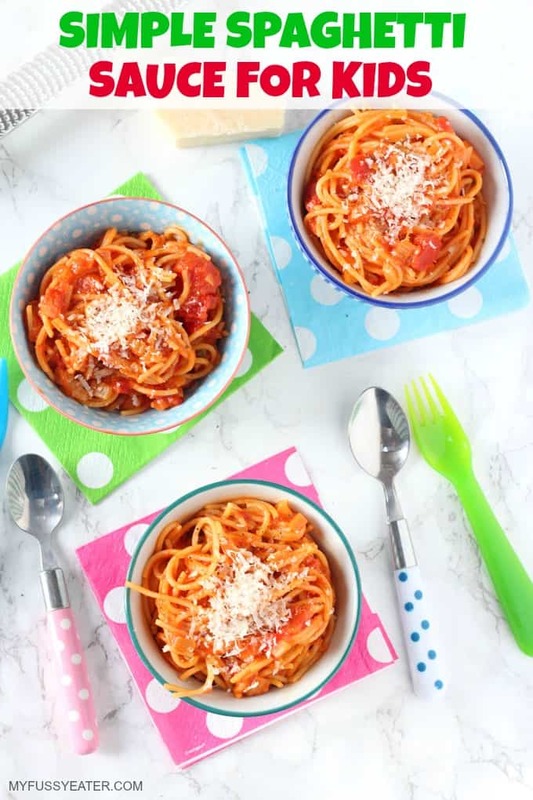 A super simple recipe for spaghetti and tomato sauce, perfect to whip up for a quick and easy kid-friendly meal! 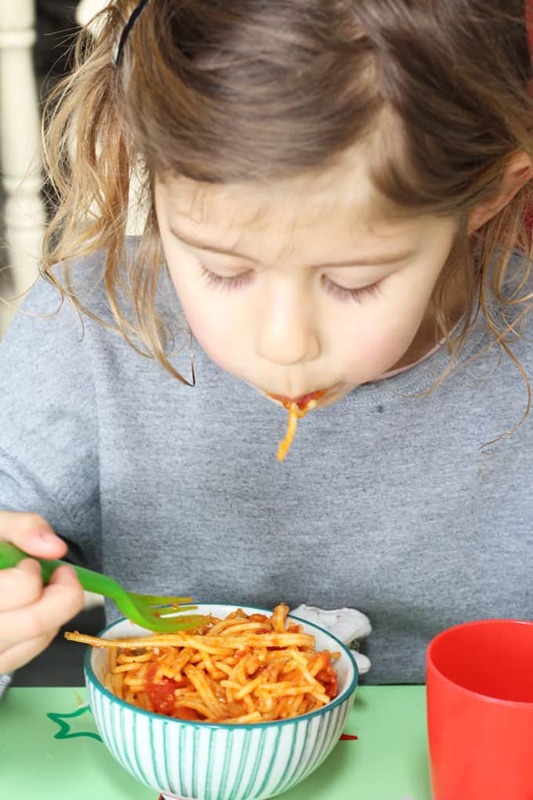 Does anyone else have a house full of pasta lovers? 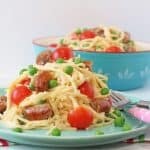 My kids absolutely adore the stuff and we probably eat it for dinner at least twice as week as I always know its a meal that they will polish off! 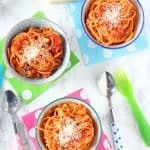 You guys probably know by now that I love my hidden veggie pasta sauces – Hidden Veggie Tomato Sauce, Butternut Squash Mac & Cheese – I love sneaking veggies into unsuspecting meals! 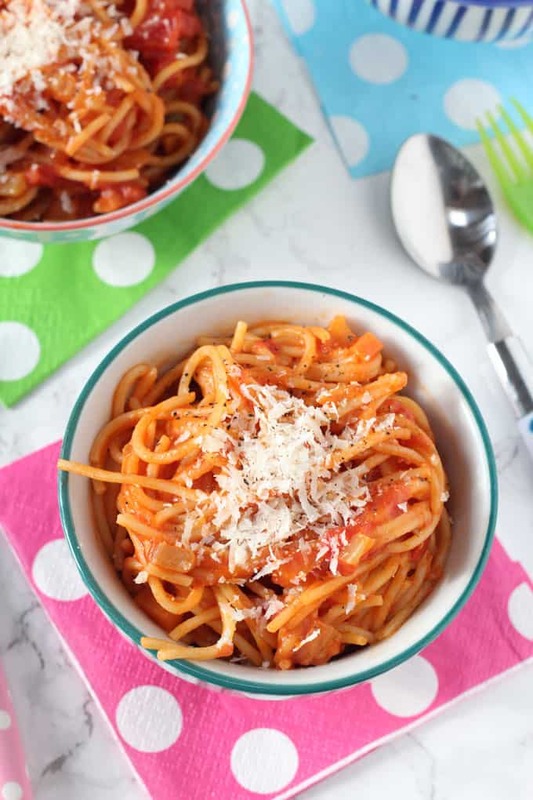 But sometimes I just need a super simple basic tomato sauce that I can whip up in a few minutes on a busy weeknight. This Simple Spaghetti Sauce ticks all those boxes. It’s made with just a few simple store cupboard ingredients that I always have to hand, along with some fresh veggies. It takes just a couple of minutes preparation time (just chopping the veggies really!) and the sauce can be left to cook in the time it takes to cook the spaghetti. I mention in the recipe that the onions, carrots and celery need to be cut quite small. This is to ensure that they cook in such a short time but it also makes them less noticeable to picky eaters! I also mention that the capers should be chopped into halves or thirds. Again this prevents my fussy eaters from moaning about them but it also helps the delicious flavours to penetrate through the sauce as it cooks. If you want to get ahead and prep for future meals then the sauce will keep in the fridge (in a sealed jar or container) for up to 3 days or in the freezer for 3 months. Add the butter and oil to a pan and melt. Add in the onion and cook on a medium heat for 2-3 minutes until it starts to soften. Add the carrots, celery and garlic and fry for another couple of minutes, stirring regularly. 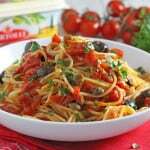 Pour in the chopped tomatoes, dried oregano and chopped capers and mix well. 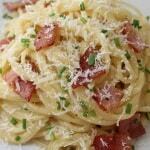 Cook on a high simmer for 10-12 minutes before serving with cooked spaghetti. Season with salt and pepper to taste. We have a very fussy 4 year old. She loved this sauce. It’s the first time she has eaten a sauce that hasn’t been blended. She helped make it. Which she also really enjoyed doing. We added a few mini beef meatballs. Thank you for sharing. One very delighted mother of a fussy 4 year old. That’s brilliant Tracey, so glad she liked it! Thank you! I don’t like marinara sauce very much, but I’ve been wanting some easy kid-friendly pasta sauce. This was great, and my 1 and 3 year olds liked it! It was even better the second day. Room temperature was good. I did add about 2 teaspoons of sugar so it wasn’t as acidic. I served it on abc pasta with shredded cheddar cheese and fresh pineapple chunks. The veggie prep took a little long, but I’m glad knowing they are eating vegetables. Thank you. We’ll be making this again for sure! Thanks Alissa, so glad you enjoyed it! so quick to make and the kids really enjoyed it. Will make again. Love how easy this is. I sometimes add frozen vegetables to make it even easier!